The Great Rift Valley Lodge and Golf Resort lies halfway between the Samburu and Masai Mara reserves, near Lake Naivasha and, since opening in 2000, the course has gained the reputation as one of the most challenging of all Kenya’s championship tracks. Laid out on the side of the Eburru Escarpment, on a remarkably flat plateau, the Great Rift Valley course measures just under 6,500 metres from the back tees and its routing weaves in and out of a number of small residential clusters, most of which are located on the back nine. Water comes into play at a few holes on the front nine: at the par three 3rd (where a small reservoir threatens the tee shot to the left of the green), at the par four 7th (which has a couple of small ponds lurking to the left of the green) at the short par four 9th, where a lake-sized water hazard fronts the putting surface. On the inward half, golfers are only ever aquatically challenged at the 361-metre 11th. I built the course at Windsor Golf & CC under the tutelage of that great golf course architect Tom Macauley of N. Ireland. Following that, I designed and supervised the construction of Leisure Lodge in Diani, south of Mombasa. 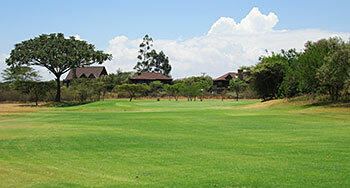 Great Rift Valley Lodge & Golf resort then followed. I have since completed a design for the Aga Khan on the island of Zanzibar but, due to political reasons, this is on hold. A 9-hole course on the shores of Lake Victoria and an 18-hole course off the Thika Highway are also on hold at the moment. The land at Great Rift Valley was total bush with a scattering of wild animals, including buffalos. Walking with a GPS, I positioned all the natural features on a map. I found the ideal position for the clubhouse, parking, driving range and, most important, the finishing hole. Figuring the layout fell into place, after many attempts! After a very bumpy five-mile bus journey, steadily climbing the dirt track from the main road to the Great Rift Valley Lodge, I was delighted to discover the golf course was set out sedately on rather level terrain. Having come across a number of cheeky monkeys on the fairways at Windsor, I thought I was prepared for the sight of the odd wild animal here and there but the intermittent appearance of grazing herds of zebras on several of the holes was more than a little unnerving. Doing my best to concentrate on the golf, I marvelled at the views towards Lake Naivasha from the elevated tee on the par three 3rd, which was easily my favourite hole on the front nine. I know the course architect prefers the left doglegged 7th as a “signature hole” but I was wasn’t happy with the way the reeds have seemingly been allowed to overgrow in the ponds by the green, largely obscuring sight of the flag from the fairway. The front nine ended in some style with a tough par four that’s played semi blind from the tee to a fairway that then veers right to a water-fronted green. In comparison, the back nine holes were a little less inspiring, though I loved the par fives at the 14th and 17th; the latter taking me and my playing companions completely by surprise as the fairway plunged unexpectedly at an angle down a steep escarpment to the green (a little reminiscent of the 8th on the Championship course at Royal Dornoch). The Great Rift Valley course is one of the most unique golfing tracks that I’ve ever played, where golfers are given an opportunity to get up close and personal with a variety of roaming wild animals (whose hoof prints tend to make a bit of a mess on the putting surfaces, I’m afraid). If you want to combine golf with wildlife safari then look no further than here to play your game.